I stenciled the background using my *new* Altenew Classy Stripes Stencil. I combined 3 colors of embroidery floss for the bow. Supplies: Stamp – Stampin’ Up!, paper – Gmund Royal, Neenah Classic Crest Solar White, inks – Tim Holtz/Ranger Blueprint Sketch, VersaFine Satin Red, die – Lawn Fawn, embossing powder – Ranger Super Fine clear, floss – DMC. 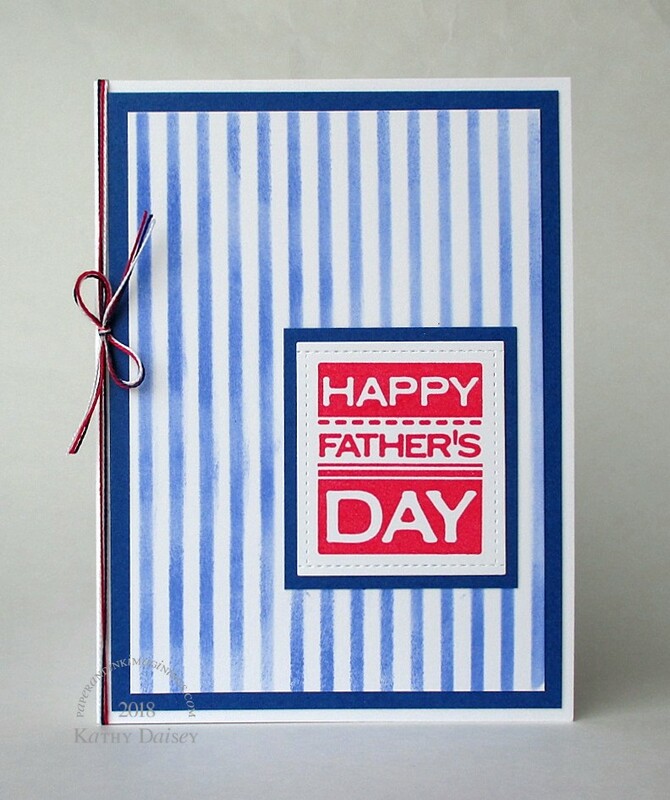 Categories: card, Father's Day | Tags: Altenew, card, DMC, Gmund, Lawn Fawn, Neenah, Ranger, Stampin' Up!, Tim Holtz, Tsukineko, VersaFine | Permalink. 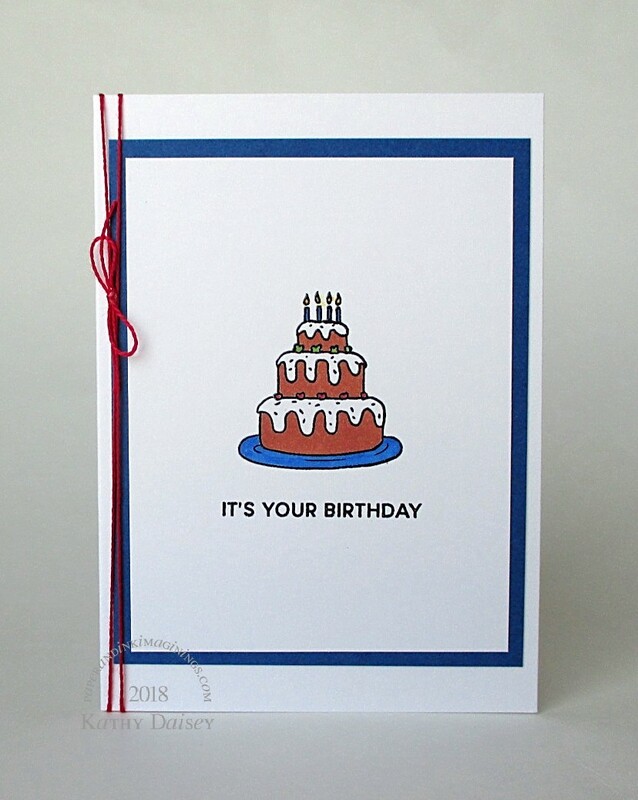 Just a quick birthday note card. Supplies: Stamps – Hero Arts, paper – Gmund Royal, Neenah Classic Crest Solar White, inks – Copic B28, E15, R29, YG17, Y17, VersaFine Onyx Black, embossing powder – Filigree Fine Art Powder clear, floss – DMC. 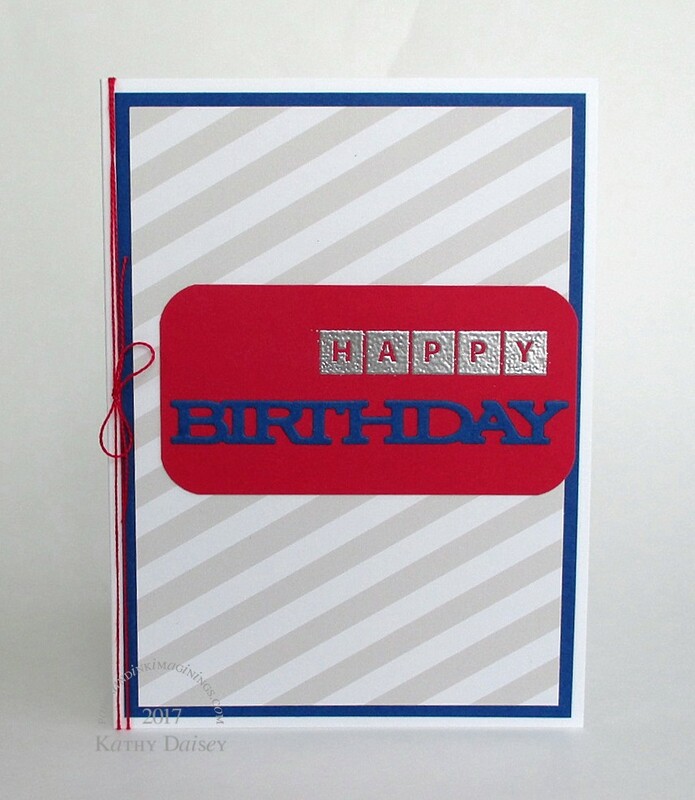 Categories: birthday, card, note | Tags: card, Copics, DMC, Gmund, Hero Arts, Neenah, Tsukineko, VersaFine | Permalink. 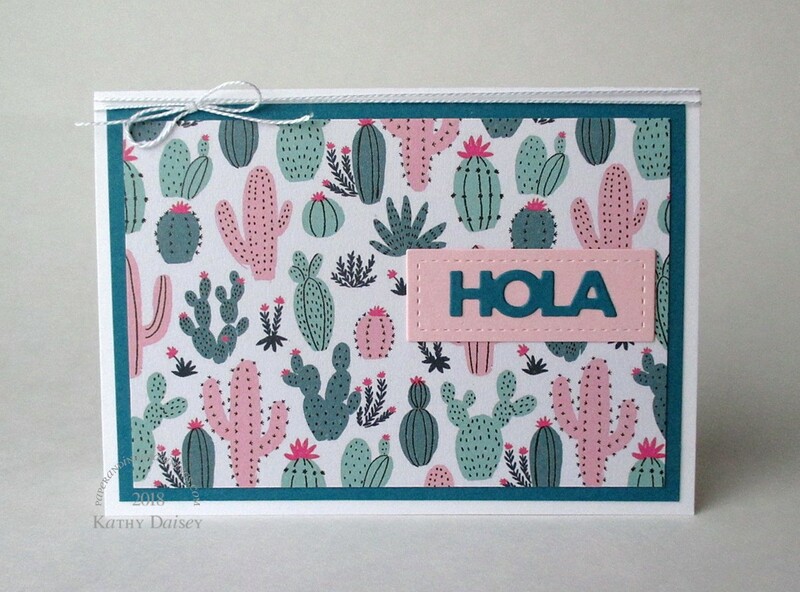 The Hola die is new to me (Technique Tuesday), and I thought it was perfect with the Good Vibes cacti paper. Supplies: Paper – Crate Paper Good Vibes, Neenah Classic Crest Solar White, Stampin’ Up! Island Indigo, Pink Pirouette, dies – Lawn Fawn (stitched rectangle), Technique Tuesday (Hola), floss – DMC. 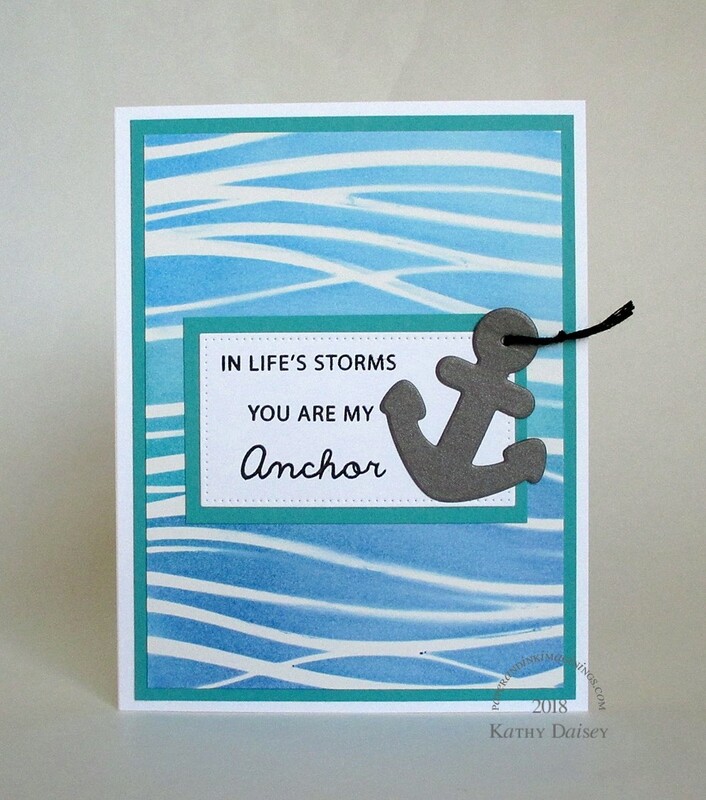 Categories: card, encouragement, note, thinking of you | Tags: card, Crate Paper, DMC, Good Vibes, Lawn Fawn, Neenah, Stampin' Up!, Technique Tuesday | Permalink. As soon as I opened the FALALA paper pad (by Crate Paper), I knew I wanted to cut an ornament out of that vintage scene sheet. This came together exactly as I imagined. Holiday panic has begun for me. I was so comfortable last week, “oh, we have an extra week between Thanksgiving and Christmas this year…” YIKES. Reality slammed into me Friday when I flipped my wall calendar to December. Holy Guacamole, how am I going to get all of this done??? I know I do this to myself every year. Supplies: Stamp – Hero Arts, paper – Crate Paper Falala, Neenah Classic Crest Solar White, Recollections Gold Mirror, Stampin’ Up! Pretty in Pink (retired), Sage Shadow (retired), ink – VersaMark, dies – Stampin’ Up!, embossing powder – Stampendous Gold Detail, floss – DMC. Categories: card, holiday | Tags: card, Crate Paper, DMC, Hero Arts, Neenah, Recollections, Stampin' Up!, Tsukineko, VersaMark | Permalink. We needed a birthday card lickety split last week! For one of our neighbors. I always think his birthday is at the end of August, but, ALAS, it is at the beginning of August. Supplies: Stamp – Papertrey Ink, paper – Avery Elle Neutral Collection, Gmund Royal, Neenah Classic Crest Solar White, Stampin’ Up! Real Red, ink – VersaMark, die – Papertrey Ink, corner rounder – Stampin’ Up!, embossing powder – Stampin’ Up! Sterling Silver, embroidery floss – DMC. Categories: birthday, card | Tags: Avery Elle, card, DMC, Gmund, Neenah, Papertrey Ink, Stampin' Up!, Tsukineko, VersaMark | Permalink. 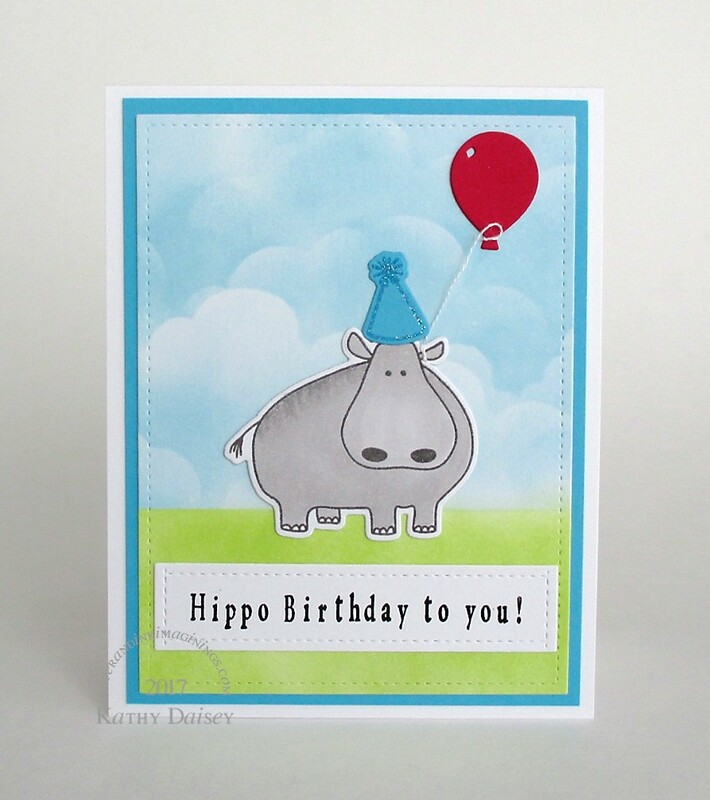 I love this hippo from Essentials by Ellen. The sentiment in the set is “hippo birdie to you”, as there is a bird in the stamp set. I was using the hippo alone, so I built my sentiment using my JustRite Times New Roman alphabet. The sentiment was cut twice with a stitched rectangle die to make the exact size rectangle I needed. Supplies: Stamps – Essentials by Ellen, JustRite, paper – Neenah Classic Crest Solar White, Stampin’ Up! Real Red, Tempting Turquoise, inks – Copic T1, T3, Tim Holtz/Ranger Distress Inks Tumbled Glass, Twisted Citron, VersaFine Onyx Black, Smokey Gray, VersaMark, dies – Essentials by Ellen (hippo, hat), Lawn Fawn (stitched rectangle), Taylored Expressions (balloon), stencil – Inky Antics, embossing powders – Filigree Fine Art Powder clear, Stampin’ Up! Iridescent Ice, floss – DMC. Categories: birthday, card | Tags: card, Copics, DMC, Essentials by Ellen, JustRite, Lawn Fawn, Neenah, Ranger, Stampin' Up!, Taylored Expressions, Tim Holtz, Tsukineko, VersaFine, VersaMark | Permalink.